The total 'result' of all these Authorization Rules eventually defines what a user is allowed to do (and thereby what a user is not allowed to do). Category 'Finance' + Status 'Ready for Publishing' + Profile 'Publishing' (in which the functionality of publishing is enabled). This means that when a user group is added under this rule, users of this group can publish any files that belong to Category 'Finance' and that are set to a Status of 'Ready for Publishing'. Files that belong to another Category or Status cannot be published, as long as this is not defined in any subsequent Rules that apply to that user group. Note: As the first step in setting up your authorizations, we strongly advise to analyze your workflow, user groups, and the required access control on paper. Users can be assigned to multiple user groups. Using this efficiently, it minimizes the number of Authorization Rules you need to specify, and thereby makes the setup and maintenance more manageable. Introducing a user group such as 'All' or 'All for <my Brand>' allows you to set some generic access control such as 'Listed in Search Results' and/or 'Read' rights for everybody involved with the Brand. This again minimizes the number of required Authorization Rules. Because of this, it is good practice to grant 'Read' access rights to every file for everybody working in a Brand in order to make sure that the system can access files if needed. The 'Listed in Search Results' access can subsequently be used to determine which files are shown to the user. Without the 'Listed in Search Results' access, the user won't see a file and thus cannot open it. For periodic Brands (such as magazines and newspapers), User Authorizations are created on the Brand Maintenance page. For project-oriented Brands (typically used by book publishers and advertising agencies), User Authorizations are created on the Issue Maintenance page. Each user is added to the Enterprise system as a user. See Managing user accounts. User groups have been created that hold all users who will be granted access to a Brand using a specific Access Profile. See Managing user groups. Access Profiles have been set up, each defining what a user can and cannot do. See Managing Access Profiles. For periodic Brands: access the Brand Maintenance page for the Brand in which you want to add User Authorizations. 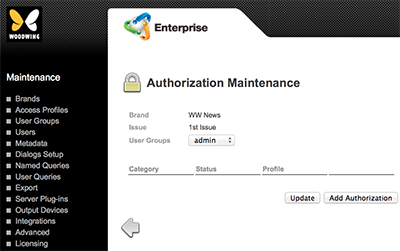 For project-oriented Brands: access the Issue Maintenance page for the Issue in which you want to add User Authorizations. Step 3. Locate the User Authorization options. Since we are working with a newly created Brand/Issue, no User Authorizations exist yet. The Authorization Maintenance page appears. Step 5. 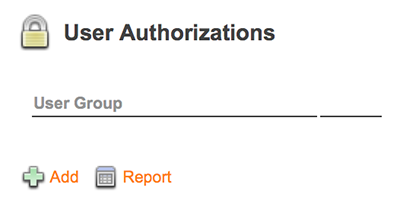 From the User Groups list, choose the group for which Authorization Rules need to be created. Lists appear in the Category, Status, and Profile columns for setting up the rule. Step 6. Make the relevant choices from each list. Click the Add Authorization button. This will save the currently added rule and automatically display a new row of lists for adding a new rule. Step 8. When finished adding rules, return to the Brand Maintenance page.